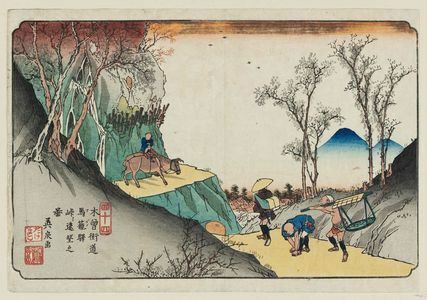 Keisai Eisen (1790-1848) learned to be independent at an early age because he chose a path that was fraught with economic danger. In a sense, Eisen represents aspects of “the real Edo period” for individuals who resided in big cities in this period of history. This applies to many deaths within his family, poverty, and uncertainty. Yet, amid all this chaos, you had natural raw energy that manifested itself through the arts. It is difficult for people in the modern world to connect with the reality of the old world. After all, infant mortality in Tokyo, Paris, Manchester, and all important cities in this period of history were deplorable. Therefore, with the average lifespan being much shorter and the central state providing little in the way of cushions to help, then individuals had no time to dwell. Of course, in all societies, you always had “a small minority” who enjoyed the material comforts of this world. However, for individuals like Eisen, then the real world was about death, hardship, and seeing the world for what it is. Yet this didn’t mean “weakness” or “pity.” On the contrary, for Eisen, this led to him being independent because he refused economic help from family relatives when he was a young man. Eisen was born in the district of Hoshigaoka in Tokyo. Today, this applies to the Nagatacho area which is part of the Chiyoda district in modern Tokyo. His father, Ikeda Masabe Shigeharu, was a very interesting character because he was a low ranking warrior who enjoyed the finer parts of culture. This applies to enjoying poetry, tea ceremonies, reading, poetry, and writing. Therefore, this must have rubbed off on Eisen. Hence, it was through his father’s friend that he apprenticed under Namiki Gohei. 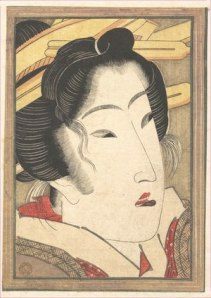 Gohei was a kabuki/kyogen writer, therefore, when Eisen was a young adult he had hoped to become a professional kyogen writer. Kyogen applies to a form of traditional theater in Japan. 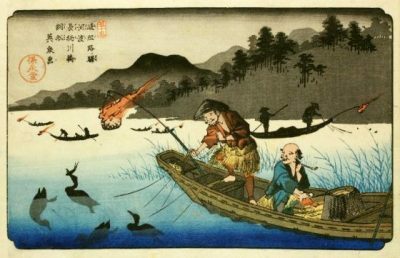 However, once more death within his family would impact on his dream hence he turned to the world of ukiyo-e and other means to survive. Hence, given the circumstances he faced – and with having three sisters – then Eisen abandoned his dream of becoming a kyogen writer. Also, he bravely refused financial support from relatives who had wanted to help him. This indicates strongly that he was tenacious, independent, extremely determined, and pragmatic. After all, he had been dealt a difficult “deck of cards” but despite this, he refused “any aces” that may have helped him. 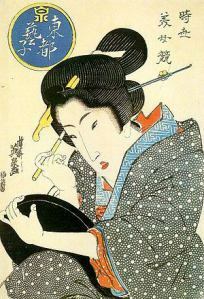 In time, Eisen distinguished himself in the field of ukiyo-e but his literature is also highly regarded. Indeed, some individuals believe that he was a ghostwriter for Tamenaga Shunsui and Yoshimi. These two writers of ninjou-bon (stories focused on ordinary people) were popular during their time but this theory is still openly debated. However, it highlights the quality of his writing to be linked with these two individuals irrespective of 100 percent certainty. Irrespective of what happened in the later years of his life, it is clear that events during his young adulthood impacted greatly on Eisen. Therefore, the choices he made when he was twenty years old, despite enormous adversity, were very admirable and extremely brave. Some Japanese art and cultural articles by Modern Tokyo Times are republished in order to highlight the unique traits of Japan to our growing international readership.